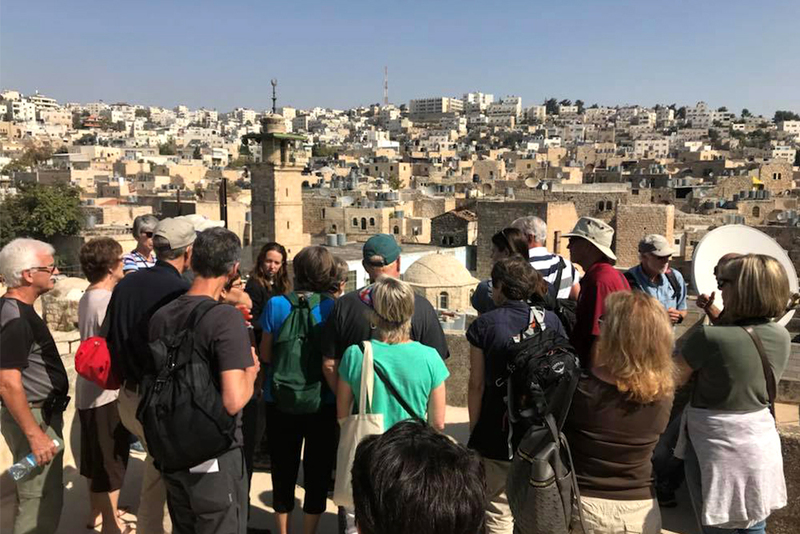 Before her recent Eastern Mennonite University Alumni and Friends Tour to Israel and Palestine, Betty Holsinger Shenk ’75 “knew it would be great.” It turned out, though, to be more than that. 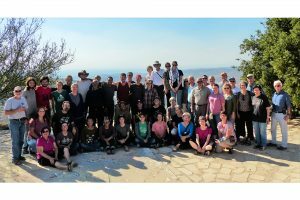 During two weeks from Oct. 20 – Nov. 3, 24 participants learned about and discussed the region’s Biblical history, explored archaeological sites, engaged in current social issues of Palestinians and Israeli Jews, and enjoyed local food and the unique geography of the region. Professor Linford Stutzman ’84, SEM ’90 and his wife Janet SEM ’91, who have led many semester and summer international cross-cultural trips for EMU, guided the group. Participants included alumni, parents of EMU alumni “and friends of EMU students who had always heard about how wonderful our cross-cultural experiences are and wanted one of their own,” said Jeff Shank ’94, director of alumni and parent engagement. Learn more about EMU Alumni and Friends Cross-Cultural Trips. The Alumni and Friends group met the current EMU cross-cultural student group, led by Bill Goldberg and Lisa Schirch, at the Tent of Nations. A hallmark of EMU cross-cultural trips is making personal connections with local residents, and this trip was no exception. 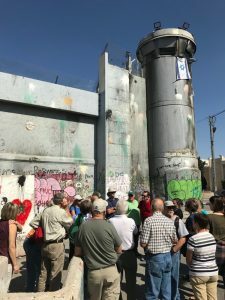 The group visited the “Tent of Nations,” a family farm under threat of settlement expansion; heard the firsthand account of how an Arab Israeli became a business partner with an Israeli Jew; and met two guides — a Palestinian Muslim and an Israeli Jew — who are both friends and co-workers and who gave the travelers two contrasting perspectives on some lesser known features of Jerusalem. The Stutzmans will lead a fall 2018 Mediterranean Voyage. In summer 2019, Professor Jerry Holsopple ’80 will lead an exploration of Lithuania’s music, art and culture. The first day included learning about life in Bethlehem inside the Wall, and its similarities to Bethlehem at the time of Jesus’s birth. For some members of the Middle East tour group, the inspiration to attend came from hearing about other people’s travels to the Middle East as part of EMU’s undergraduate cross-cultural program. When Kendra Martin ’05 was a student, many of her close friends went on that trip, and returned having been “impacted, deeply,” she said. Going on this trip brought her “full circle” and allowed her to experience first hand what her college friends had told her about. Maddie Clemens ’16 had a “life-changing” semester on the Middle East cross-cultural trip led by the Stutzmans in 2014, and was eager for the rest of her family, including sister Abby Clemens ’16 and parents Becky and Doug “to experience the people and places that had so greatly impacted her,” said her mother. This fall, the four participated in the Alumni and Friends Tour, together. “We couldn’t have asked for a more enriching experience,” said Becky Clemens. The trip traced 2,000 years of the biblical story and 4,000 years of human history, and offered Martin something she’d been wanting: motivation to read the Bible. 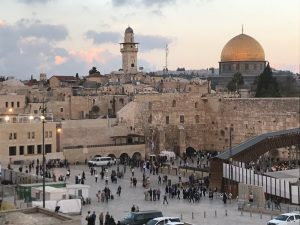 Overlooking the poignant symbols of Jerusalem’s holiness and history: The Western Wall, and the Dome of the Rock. “We were encouraged by those on both sides of the conflict who expressed their unwavering commitment to continually seek ways to live as neighbors and bring peace to their land,” she said. 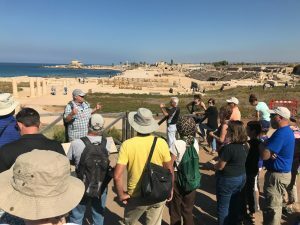 In the magnificent ruins of Herod the Great’s Roman-style port city, Caesarea, famous for the story of Peter and Cornelius, and Paul’s final journey to Rome. Linford Stutzman said that he and Janet love the impact they observe on cross-cultural participants. This was an incredibly amazing 2 weeks, in a land with a tortured history, where we heard from Israelis and Palestinians who shared their stories with us. It will take a long time to process all we learned, and my list of books to read and documentaries to watch is a long one: suggestions from our guides and from Linford and Janet, who led our group with the passion they have for this land and its inhabitants! The participants were mostly strangers when we started traveling, but became friends that I will treasure! I feel our leadership fostered what became a pilgrimage, not a vacation, a good thing!